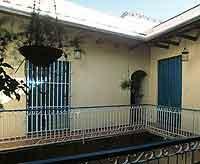 The lovely neo-classical three star Hotel del Rijo was formerly the residence of the renowned and illustrious doctor Don Rudesindo García Rijo in 1818, after whom it is named. It’s located on the tiny Plazuela Honorato del Castillo looks out toward the 17th-century parish church, Parroquial Mayor del Espíritu Santo, and is very close to the bridge over the Yayabo river, both of which are National Monuments, allows guests to step back in time as they move through the narrow streets of Sancti Spíritus that date back to 1514. A thoughtful restoration around the Millennium reinvigorated this former dilapidated mansion. You feel like you're stepping back in time as you pass through the tall nail-studded carriage doors to a lobby with wrought-iron chandeliers beneath a sturdy beamed ceiling. The charming little bar has a small humidor that usually tempts us to buy a stogie and sink into the lobby's leather lounge chairs with mojito in hand. Breakfast is served in the delightful atrium courtyard with Mughal-style fountain. However, that's it as far as meals go. No worries, as directly across the street, the Mesón de la Plaza replicates a Spanish bodega and delivers excellent Iberian dishes (such as garbanzo with bason and sausage), plus a delicious baked chicken in orange sauce. We've always thought the inflatable plunge pool on the rooftop to be a disaster just waiting to happen. There have been reports of major spillage! All said, this is one of few provincial hotels in Cuba that should leave you smiling from beginning to end. Not least because it represents excellent value. 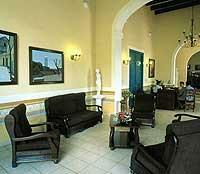 Until recently this hotel was known as Hotel Encanto del Rijo and Hostal del Rijo. The 16 spacious double guest rooms surround the courtyard on two levels, with upper rooms accessed by a mahogany staircase. Lofty beamed ceilings, soothing cream and light-blue color schemes, and modern bathrooms with lots of marble are among the highlights. You even get satellite TV and phones. Take an upper room at the front (numbers 5-8), which have balconies overlooking the plaza.